no recording has come forth yet. Coreplay: Last night I had my first opportunity to see a band that has significant importance in my life. I was able to get tickets at the closest balcony table on the right balcony arm so was able to have a perfect view of the concert and the acoustics from where I sat were PERFECT. I spent the first 5 songs on the floor with friends and thought it was a bit overcrowded but the energy in the crowd was fantastic. Surveying this from the balcony was amazing. Seeing this sea of people singing along to most songs and waving their hands. I attempted to take pictures from the balcony but the digital camera I had took very blurry photos. From what I heard disposable cameras were fully allowed inside and I assume this will true for all other shows as I believe it is up to the band more so than the venue. The band sounded terrific. Most of the performance fell on Chris who is super animated compared to the rest of the band. I was completely impressed with his energy and how great he sounded live. The most emotional moment in the crowd was during yellow. I think the entire house was singing along and the whole crowd was bathed in yellow light. From the balcony it was amazing to see the crowd and I almost watched the audience more than I watched the band for this one. My only complaint about the show was its length. It was only 1:35 with the encores. I suppose the important thing is that the show was 100% wonderful while it lasted and it is better to leave an audience wanting more than walking out before its over. Still I REALLY WANTED TO HEAR ARUSH OF BLOOD OR AMSTERDAM! These songs deserve to be played. The audience gave the loudest ovation that I have ever heard after Scientist and I just can't believe the band couldn't have put in another 15 minutes or so as this was the tour opener and the crowd was so excited. All in all this was one of the best shows I've been to in terms of sound and crowd energy. It was a fantastic time. I made the 6 hour trek to Atlanta last year only to find that the show was cancelled at the last minute and I had missed a 6 song impromtu show in the parking lot. Needless to say I was thrilled to have this opportunity to see the band in a great venue minutes from my home. Yankgirl (Courtney): YAY for Orlando! I am really proud of Orlando! They crowd was amazing! I was right up front across from Guy & I remember looking up during one of the last songs & it was unreal. Practically everyone in the place was on their feet & singing. I could have cried. It was wonderful. I'm so happy everyone was there for Coldplay, ya know? Everyone had a great time & for the most part everyone was really chill & nice which is always good :-) I am so happy I went. It really was the best concert I have ever been to & I've been to a lot this past year. Hobbes: I attended the Orlando concert (drove from Tampa and took the day off work ) and it was so worth it. While I, too, was bothered by the short length (I could listen to them forever! ), the concert was amazing! Chris's energy is remarkable, and his voice is just as melodic live! I was really enjoying the entire atmosphere. The audience sang along with every song, nailing all the words and showing the band that they were true fans, not just those who listened to the radio hits. I was really looking forward to them playing AROBTTH and was disappointed when they didn't. However, the entire performance was an experience I won't soon forget. I think it was by far the best concert I've ever attended. Sandra Jones: I went to the Coldplay concert last night in Orlando, Fl. at the Hard Rock Live...I must say the concert was amazing!! One of the best concerts I have been to in a while. Chris just had so much energy jumping around and he ruled the piano. The atmosphere was great. The crowd was loving every minute! Anyone who has a chance to see them I highly reccomend it! Blonderoxy: I was front row for the show last night at hard rock live and let me say that it was awesome! I have seen many concerts and Coldplay by far was the best show I have ever been to! They played their asses off! They did not take 10 minutes inbetween songs to tune their instruments. Their encoure was also short. They rocked, and also played a new song that is not yet released entitled "Moses". Chris said it is a song about falling in love and meating someone very beautiful. He played it acoustic saying it was so new they did not have parts for drums/guitars. Anyways, I was really impressed, they rocked and were so nice! If your going to one of their shows you will definately have a blast! IhopeInever: I was at the show lastnight too. It was completly soldout. It was AWESOME!!! ; Ron Sexsmith was ok...but I think everyone just couldn't wait to see Coldplay. I was probably 17 ft from the stage. Chris would throw his water into the crowd and Jon played a hurmonica (I think that's how u spell it) then threw it into the crowd also...I almost caught it!!! Anyways...It was a great show...the best I had ever seen!!! Velvet Morning: The Orlando concert was amazing!!! I was in the front row in front of john. The crowd was amazing and I met some really cool fans in the line. I didn't think that after the concert the night could get any better, but as I was walking back to my hotel, who do I see in a hidden corner??!! Chris and the band!! I got their autographs and got to hang with them for 5 minutes while the band loaded up their suitcases on to the bus!! I have to say that they are awsome, they are so down to earth!!! Chris told me and my friends that he hoped that they put on a good show for us. John was also incredible, I got to talk to him a little bit about his guitar gear, awsome guy!!! Justrideit: Absolutely amazing! Couldn't have asked for a better concert! The energy, the crowd, the lights, the setlist, etc was incredible. They were really appreciative of the crowd. The crowd was singing along to every word and screaming non-stop. The lights were out of this world, which attributed to the great atmosphere, with mostly red, green, and blue lights. Chris was very into it. He dedicated a song to justin timberlake, saying how he founded 'orlando. crichton91 everyone, this was, without a doubt, the best concert i have ever seen in my life. it was even better than Dave Matthews in concert. chris is incredible. his enthusiasm is intoxicating and contagious. 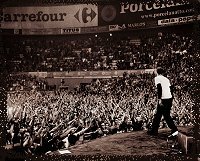 its obvious that he loves his audience. the rest of the band just melds so well and does an awesome job. the light show made the whole experience exciting and it really reflects the music. the most memorable experience for me was in the opening number. the group comes out in the dark and gets in their places. and then they start right into politik with the stobe lights flashing in time with the music...incredible. Chris played a new song..."Moses"...wonderful. "As Moses had power over the seas, so you have power over my heart." What romantic and beautiful lyrics. thank you guys! an awesome and unforgettable experience! to everyone else...if this show comes within a couple hours of where you are, DON'T MISS IT!!! On my way back to Miami I decided to see if I could get in the concert, but I couldn't make it back in time, by the time I got to UM the concert was halfway through, Oh Well. EmpressKaren: The Orlando show was F-ing Awesome! Possibly the best live show I have ever seen. It was an intimate venue and the acoustics were great. Chris had so much energy, he was flailing all over the stage and the piano! The best part was that they are REAL musicians with REAL talent and artistry. Unlike so many other bands that are fabricated in the studio, what you hear on the CD is what you hear live. I would advise any Coldplay fan to see them if you get the opportunity! Absolutely Fabulously Beautiful! Matt Vermin: Ok , this was , without a doubt , the best show I have ever seen . Every song was beautiful , and the crowd seemed to know every word of every song . I loved it . The interaction between Chris and the crowd was extraordinary . It was really a night to remember . Nocturnel: Just saw the opening show of coldplays tour here in Orlando! I haven't had a religious experience in music since U2's Rattle & Hum. Wow! I think this is one of the most important bands of our time. It's an undergournd music revolution. They're brining artistry and real music to the forefront of the industry. You gotta see the show. Chris sang a new song, just him on acoustic guitar. He said it was about "the most beautiful girl" probably about Gwyneth. Good song. He also dedicated a song to Justin Timberlake for putting Orlando on the map. Really good show, really good times. Kelly Sanchez: Coldplay was brilliant. They started the night off with "Politik" from their 2002 album A Rush of Blood to the Head. Immediately as the song began, flashing strobe lights mimicked Will Champion's erratic, hard drumbeats and introduced the illuminated fans to the band's absorbing, confident sound. Front man Chris Martin bounced all over his seat as he pounded his piano center stage. He looked as if he was impersonating Stevie Wonder with his wild back and forth head sways. Towards the end of the opening number, Martin busted out with his own rendition of "Chopsticks." The simplicity of the melody was intriguing. Next, from their 2000 debut album Parachutes, Coldplay rocked with "Shiver." Martin stepped away from the piano and picked up his six-string. Like Beck, there was a wonderful oddness to him. He jumped around the stage in a way only the British can move. The wiry singer had charmed the crowd, encouraging them to sing along with him, which they excitedly did. Behind each note played, there was a deep, honest passion released. Guitarist Jon Buckland's distorted riffs and bassist Guy Berryman's riveting rhythm were full of genuine, raw emotion. Due to Martin's voice strain, the British band had to cancel a number of American shows last year. Rumors of the band breaking up due to no more inspiration headlined newspapers all over England. But like all heroes, Coldplay shattered the scandals with their smash album A Rush of Blood to the Head and persevered through the controversies. 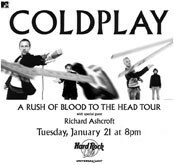 Orlando's Roberta Markowitz said, "Coldplay's a great band. Whatever kind of genre you're into you can adapt to Coldplay's music. I think this concert was energetic. It was one of the most liveliest shows I've ever been to." For their encore, Coldplay heated up Hard Rock Live Orlando with their latest release "Clocks," "In My Place" and "Trouble." Shawn Anastasia of Orlando summed the evening up perfectly when he said, "This show kicked some f*ing a$$."